RT’s historical photo-puzzle about the last reigning royal family in Russia, the Romanovs, is at ‘ready-steady,’ with the website launched and all the social media accounts published online ahead of the official launch in April. The digital mosaic of 4,000 photos from the family’s private archives will hit the web on April 8, exactly 100 days before the world marks the centenary of the Romanov’s tragic execution by the Bolsheviks. Having access to the best of what the photo industry had to offer in the early 1900s, Nicholas II, his wife Alexandra, and their five children all tried their hand at taking pictures. The photos will not be cross-posted through social media, rather the opposite: each platform will provide followers with unique content and style. Users are invited to follow all accounts, or choose between Instagram, Twitter, YouTube, and Facebook, all featured on the project’s official website. YouTube will publish mini-videos based on the Romanovs’ photo collection, featuring historic aspects of the era in which the last Tsar’s family lived, as well as the little-known stories behind rarely seen photos. Follow HERE. Instagram will focus on lifestyle images from the Romanov family album, presenting the most artistic, unusual and difficult photos taken by the Romanovs. Also, Tsarevich Alexei’s Spaniel Joy brings a canine perspective to the lives of his humans on a separate account. Follow HERE & HERE. Facebook will provide followers with high-quality photos and panoramas from the Romanovs’ collection mixed with lyrical stories about the lives of Nicholas II, Alexandra, their children, and friends. Follow HERE. Twitter delivers first-person stories from accounts you already know from #1917LIVE. Renowned author Helen Rappaport will lend voice to the four royal daughters. Follow HERE. 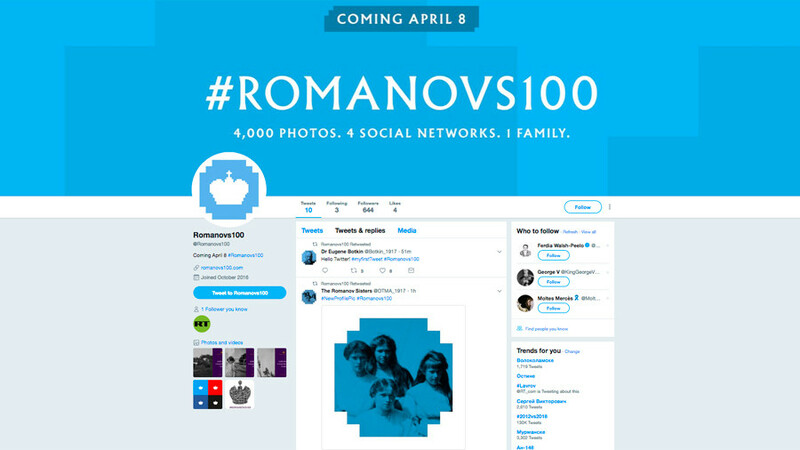 Although original content will not start appearing on the accounts until April 8, the #romanovs100 team promises a steady stream of teasers to keep the audience engaged.